At Ubiquity Press we believe that academic publishing is about achieving the widest possible dissemination of research, with the maximum benefit for authors, and in a transparent, cost-effective manner. If you are interested in starting or transferring an existing journal, or publishing a book, please contact us and we will be happy to explore this with you. 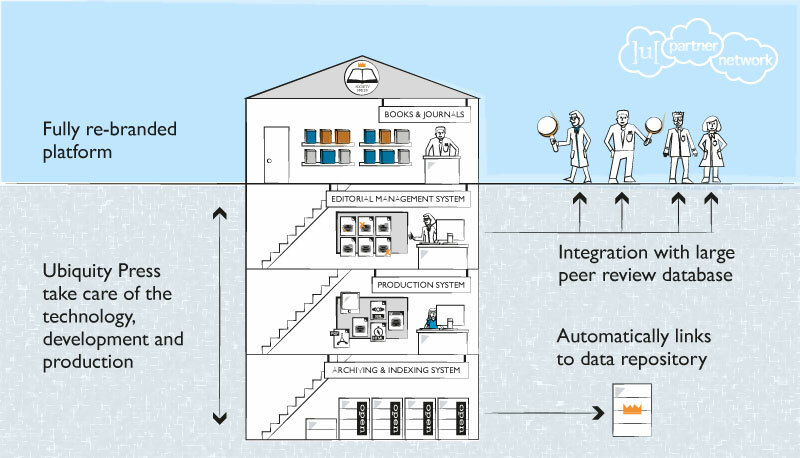 We believe that the control of publishing should be maintained by researchers, and we therefore especially support publishing by academic societies and university presses. We also recognize the value of research data and software, and provide important solutions to enable their publication. Ubiquity Press journals are published as 100% open access, with Creative Commons CC-BY licenses. Highly cost-effective, all journals have low and transparent APCs. This allows institutions to make better use of their funds, makes open access publishing affordable (especially for disciplines with less funding such as the humanities), and allows societies to replace subscription income. We provide dedicated editorial support to all journals, and ensure that they are operated with a high degree of integrity, with full anti-plagiarism checking, rigorous peer review, and open data publication. For more details please see our Research Integrity page. The above model allows the journal to be completely sustainable based on APCs alone. Ubiquity Press was born open and electronic, without legacy costs such as managing subscriptions and print distribution. Our platform makes use of open source software wherever possible, and all of our production work is done offshore by a highly-skilled but cost-effective team (see our FAQ for details of our outsourcing policy). We can therefore maintain a base APC that is around 25% that of many of our competitors. This provides a lower-cost alternative for authors, funders and universities, and means that library and research budgets can go further. Our fees are fully transparent - you can trust us that every penny goes towards providing a high quality, sustainable publishing service, and not towards sky-high publisher profits. Ubiquity Press books are (full-text) peer reviewed and published fully open access, licensed under a Creative Commons Attribution (CC-BY) license, as we believe that book authors should receive the maximum dissemination of their work. This is important for increasing the impact of research, in particular in disciplines where a high proportion of work is distributed in book form. The books are free to read online and free to download in a variety of formats (currently PDF, EPUB and MOBI). Copyright is retained by the authors and we don't require any exclusive license. Ubiquity Press books are downloadable from Open Access Publishing in European Networks (OAPEN), Directory of Open Access Books (DOAB) and unglue.it and indexed in OCLC Worldcat. Hardcopies can be purchased through the normal bookseller outlets, often at well below average prices. As standard practice we return around 30% of profits from print sales of the book to the author(s)/editor(s). 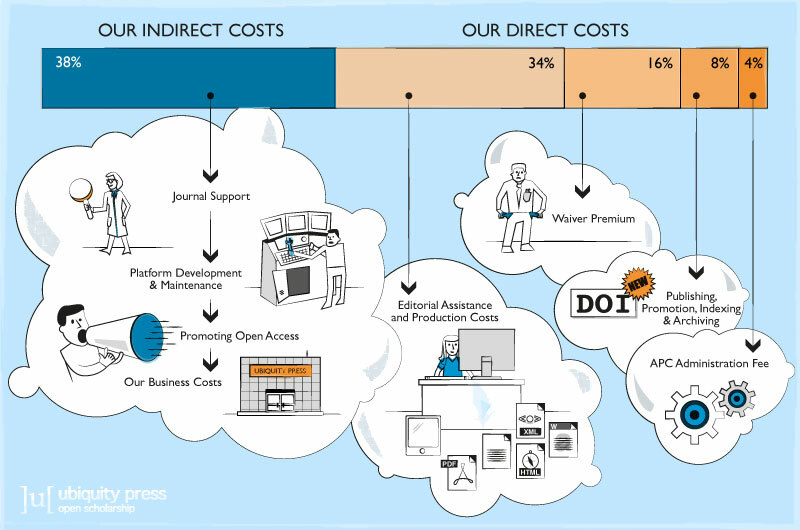 Remaining profits are directed towards maintaining global distribution and indexing, and reinvesting into the platform to help reduce costs for authors wishing to publish on an open access platform. We recognise that authors benefit from having their work disseminated as quickly as possible. Once a book has passed peer review and final copy has been supplied, Ubiquity Press undertakes to publish the book as quick as possible (usually within 2-4 months, depending on extent and complexity). All individually authored items (i.e. books, chapters, data) are citable using DOIs. Citations are tracked, which enables authors/editors to take credit for their book publications in the same way they currently do with journal articles. If you wish to submit a book proposal, please use our online book management system by clicking the button below (registration takes one minute). However, if you would like to prepare your proposal offline or prefer to send it by email, please send it to editorial@ubiquitypress.com and use our offline proposal form (Word file). Please complete all information on the form, or provide detail why it cannot be provide, so that we are able to fully assess your proposal. Our business model involves charging only for the work we actually do and it does not rely on print revenues for sustainability. Because of this, we release all content under a CC-BY license, which enables maximum dissemination. Other publishers that rely on print revenue often use more restrictive licenses, limiting the reach and impact of the author's work, whilst also only selecting to publish 'sellable' titles. Books are published with processing fees similar to those used for journals (in this case Book Processing Charges, or BPCs). As with our journal APCs, we can maintain BPCs, which are significantly lower than those offered by other publishers (this is particularly true when comparing CC-BY options). The BPC is typically covered by a funder or institution. We strive to keep the BPCs as low as possible whilst retaining an excellent service for our authors. For information on funders and institutions which make funds available for open access book publications visit our open access funds page. Please feel free to get in touch with us regarding such funds and we might be able to offer assistance or advice. Inclusion in search, indexing and aggregation platforms, library catalogues, library suppliers, discovery services, etc. English language copyediting (CE) will also be added to our services as standard, however, this may be removed to reduce the BPC if the authors are able to provide high quality texts or arrange the copyediting themselves. If you are interested in the camera-ready option, please get in touch. In addition to the above, we offer optional book index creation (IN) services. The table below shows approximate BPC quotes (excluding VAT), based on the size of the book and services provided. Please contact us for a quote by providing information on estimated word count, number of figures/tables and data/media items, services required and whether it is for an edited volume or monograph. *above prices should be taken as a guide only, as each BPC is constructed individually, based on the content and services required for the proposed book. Taking out a membership with Ubiquity Press is a great way for institutions and funders to demonstrate their backing of a more sustainable and affordable open access model. We offer a content membership to enable easy accessioning of content and measurement of its use. Our broad subject coverage also means that the benefits of open access publishing can be enjoyed by researchers in a much wider range of disciplines. The Ubiquity Press content membership gives libraries a collection that currently comprises the open access content of all members of the Ubiquity Partner Network, including both journals and books. The content is available as open access, but the aim of the collection is to assist libraries with accessioning it correctly, and to measure its usage in comparison to subscription content. The collection currently contains approximately 590 open access journals and 263 open access books, with resources from all subject areas, i.e. Arts and Humanities; Health and Life Sciences; Science, Engineering and Technology; Social Sciences. The nominal annual fee of £2,000 (set at roughly the level of the average APC, for the entire collection) covers the costs of high quality MARC records and COUNTER reports, while new content is added on a quarterly basis at no additional cost. It also provides financial support towards the development and maintenance of the common platform the content is published on, as well as to subsidising hosting for the developing world and covering waivers for authors without funding. Research funders can sign agreements with Ubiquity Press to make it easier for researchers involved in funded project to publish open access and to lower overall costs. Whether your society is small, with 2-3 journals, or has a large portfolio of journals and books, Ubiquity Press can provide it with a fully re-branded, professional publishing presence. We provide you with a fully open access service to ensure the widest possible dissemination and impact of your members’ work, while also offering you a range of ways to continue to earn vital revenue from its operation. As our base APCs and BPCs are highly cost-efficient, societies can afford to charge a fee on top of this to generate income, while still remaining price competitive. To find out more about hosting your society’s publishing operations with Ubiquity Press, please contact our team. University and academic society presses play an essential role in academic publishing, having a close relationship with researchers and a better understanding of their needs. Many universities and their libraries are considering starting new presses in response to this demand, but in difficult economic times many established university presses are also being forced to close down due to funding difficulties. Ubiquity Press can provide your institution with a fully featured and completely re-branded platform hosting academic journals and books, and including all systems required to manage and operate the press. We take care of the technical and production side of things, freeing you to focus on what you do best – supporting your researchers and helping them to disseminate their work as widely as possible, with the status and prestige of your own institutional imprint. By leveraging the scalability and existing operations of the Ubiquity Press platform, this is a fully sustainable and highly affordable option that enables universities to take back control of publishing. To find out more about running a press at your university with Ubiquity Press, please contact our team. Institutions and societies that run their presses with us become members of the Ubiquity Partner Network, with benefits such as shared resources, cascading content, and Steering Board membership. Visit the Ubiquity Partner Network page for more information and a list of partners.